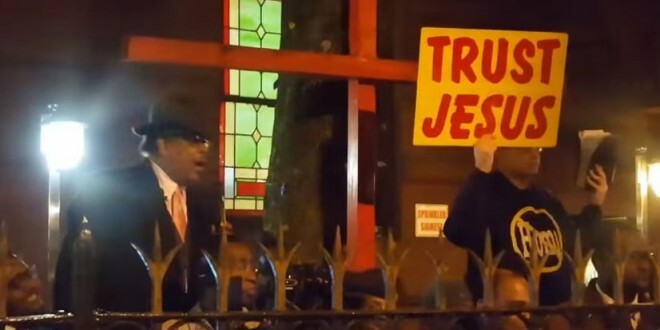 HARLEM: Hate Pastor Screams "Faggots!" At Protesters, Tells Press He Can't Pay City Fines [VIDEO] - Joe.My.God. Atlah Worldwide Church could be fined as much as $11,500 for continuing to ignore landmark violations, said the Landmarks Preservation Commission. The church was found guilty of five landmarks violations in August. It has been served with a second round of violation notices that carry heavier fines and are scheduled to appear before the Environmental Control Board in December, according to the LPC. Atlah has not paid the original $1,825 because it doesn’t have the cash, according to its pastor James David Manning. “I plan to pay them,” he said. “I don’t have the money right now; we are cash-strapped.” After August’s decision, the church taunted the city by writing “We won, we won, have a nice day you damned homos,” on its sign. As you’ll see below “faggots” was just one of the slurs screamed by Manning.